Summer Stock. 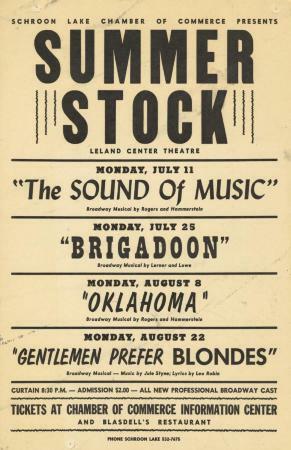 Poster advertising theatre at Leland Center, Schroon Lake; Sound of Music, Brigadoon, Oklahoma, Gentlemen Prefer Blondes. "Professional Broadway Cast." Source: Adirondack Museum Library, Broadside collection, MS 61.82, folder 6.